I’d like to introduce you to our new living room arrangement. This room is our most used room, despite being television free (on purpose!). We entertain in here, play with Baby O and relax in here. First of all, please excuse my poor photography. The room is wide and it is difficult to get a picture of everything. There are two chairs against the striped wall, although you can only see one. The corner of the room has a bin of toys and the boppy lives there too. I’m looking for a better system to store those things. STRIPES: The stripes have been around for a while and I LOVE THEM. I did it while Hubby was out of town for work. He hated the idea but loves the result! Typical. As my mother says, it’s easier to ask for forgiveness than it is for permission. Anyway, that wall was a nasty burgundy when we bought the house. JUST that wall. The rest was a paper bag tan… all in flat paint (WHHHHYYY!). It acted as a black whole and sucked all the light and helped make the room feel super cramped. The stripes freshen it up, emphasize the length of the room, enhance the height of the wall and contrasts just right with the surrounding gray walls. Colors are both Behr paint and primer in one, eggshell finish (for durability and light reflection). Gray: Ashes, Cream: Roman Plaster. FURNITURE: The couch (Ikea Ektorp but looks soooo Pottery Barn) used to be against that wall and the chairs floated wherever for a while. I put the couch under the window for two reasons: it keeps the dogs from standing the the sill and barking and it is a better use of space. Also, the couch has other tailored slip covers available for a quick and inexpensive change whenever we feel like it. 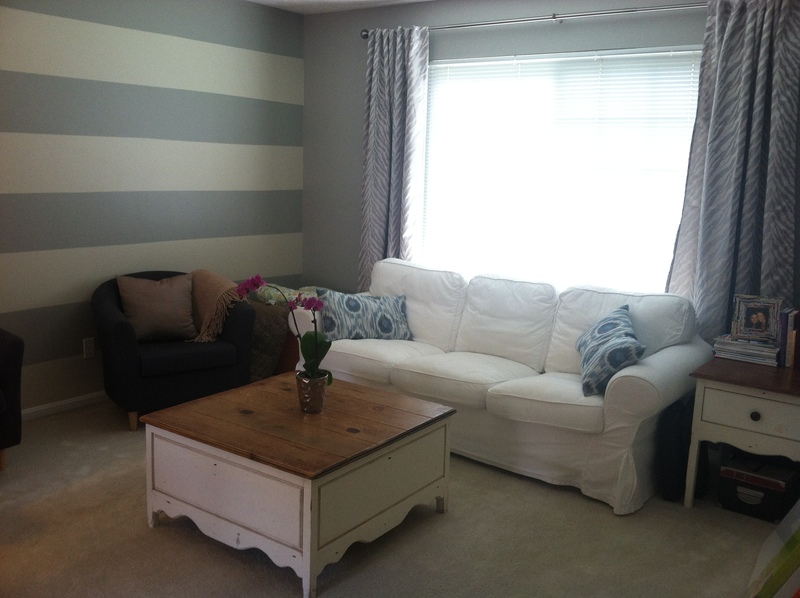 The chairs (Ikea Tullsta) went on the striped wall for more contrast and to open up the floor space. This layout definitely opened up the room and allows for more floor space as well as a better traffic flow. We’ve been using tons of floor space since Baby O can sit up, roll, scoot and such. Also, the wall opposite the striped wall is only a half wall that overlooks the landing/foyer. I didn’t want anything there since Baby O will likely learn to climb soon. That wall is home to a toy bin and a Jumparoo. As you can imagine, they are cramping our style but I’m trying to minimize that effect. The wall opposite the couch is open to the dining area which is currently needing some love. I’m thinking about a fantastic rust colored rug. Don’t tell hubby yet. The coffee table and end table are yard sale finds. Ok, well a friend had them in her pile to sell and I saw them in her dining room and jumped in to buy them before the yard sale. But the coffee table has drawers, rounded corners and a solid build. Baby friendly and stylish! I bought them both together for $65! I’m sure they were out of my price range originally. ACCENTS: All pillows (blue ikat and bronze ripple- but I can’t find it online) and the chenille throw are from Target. The subtle zebra curtains are as well. Who says you can’t mix patterns? Just do it in moderation and with balance. NEXT: Hanging pictures. I have a huge pile and it’s going to take an entire weekend to look at the arrangement options. I’d like to add hints of that peacock blue from the pillows elsewhere. Better lighting is also on my list.